What sort of devilry is this?! A mash-up of Holmes & Stoker, of reality and fiction?! Or rather a series featuring their young, spunky female relatives set in an alternate London — a London powered by STEAM?!?! If you follow this blog, you may know of my ongoing search for great YA steampunk and my recent disappointments in the genre. But, in regard to the steampunk side of things, I’m happy to report that The Clockwork Scarab pleasantly surprised me. The alternate timeline Gleason has created for her Misses Mina Holmes and Evaline Stoker is thoroughly, utterly, and immersively steampunk. Organic, necessary and inextricable, machinery and steam have shaped the very lifeblood of this alternate Victorian London. In other words, it’s more than a few gears, a pair of goggles and a random dirigible sighting. World-building aside, the heroines are the ones that really made this novel shine. I love both Mina and Evaline (though Mina is perhaps my favorite) — two heroines that could not be more different or more alike. Mina, the highly intelligent, hyper-intuitive girl who loves a good mystery, strives to prove her famous uncle wrong in his belief that women investigators are impeded by their emotionality. Evaline, the latest in a long line of legendary and fearsome vampire hunters, has superior strength, amazingly fast reflexes, awesome fighting skills… and a highly inconvenient (and slightly ironic) fear of blood. Both girls have a particular set of talents, both come with their own sets of baggage and damage, both are trying to follow in (yet also escape from) the long shadows cast by their families’ legacies. And both are striving to be more than what Victorian societal conventions dictate they should be. Gleason has done a wonderful job fleshing out both girls, and developing their… interesting… relationship dynamic. She’s done this in part by utilizing dual narration featuring both Mina and Evaline. Which, as you know, I am totally a fan of. As I’ve hinted at, there are a lot of girl empowerment themes running throughout this novel, relevant for girls of all ages, but wonderfully effective against the rigid backdrop of the repressive Victorian era. So, “YAY!” for that. You go, girls! The story and pacing, though interesting, I found to be a little bit… slow, though it may be the result of the repeated interruptions I experienced while reading this book. I was only ever able to read this story in snatches at a time, and that can definitely skew the perception of pacing. Also, the mystery, while compelling and while providing the reader with a bunch of interesting clues, didn’t resolve enough for this particular story. Most of the questions that stacked up remain unanswered, the threads a little too loose. “But,” you cry in indignation, “this is a series!” And I know that. I don’t mind loose threads being left for the next book(s). I’m one of those crazy people who actually love a good cliffhanger, because it is the absolute best kind of despair. BUT throw the readers a bone, yeah? In my opinion, even with a serialized mystery, within this individual story, a few more revelations (leading, of course, to more questions) would’ve helped this particular installment feel a little more… finished. However, though I had some issues, the story of society girls being kidnapped and found dead (under suspicious circumstances), the theft of Egyptian artifacts from the British Museum, a time-traveling boy, and the partnership of these two highly-skilled, capable young women in a steampunk London where reality meets literary, ultimately thrilled me down to my toes. 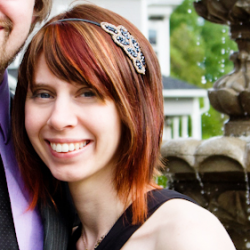 Speaking of thrilling me to my toes, let’s talk romance. With the blurb and it’s promise of “three mysterious gentlemen” — – a formidable, gadget-obsessed Scottish detective; a handsome time traveler armed with a dying iPhone who comes from a world where Sherlock Holmes is merely fiction; and an infuriating man with mysterious ties to the London underworld — one might be expecting a healthy dose of “love story” in this book. 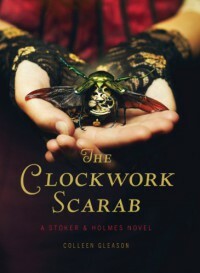 While it is present, and while it does indeed deliver toe-tingling moments, the romantic aspect of The Clockwork Scarab is not exceedingly prominent as the novel focuses more on the girls — Mina and Evaline’s investigations, personal struggles and growth, and their fledgling partnership. It does, however, lay some fantastic romantic groundwork that promises great things to come. And I, for one, cannot wait to see how that is all going to play out. Overall. With a fascinating steampunk world, an imaginative partnership that combines the classics in a wonderfully creative way, an intriguing mystery, and the tease of romance to come, I’d have to call The Clockwork Scarab a very promising beginning to the Stoker & Holmes adventures.